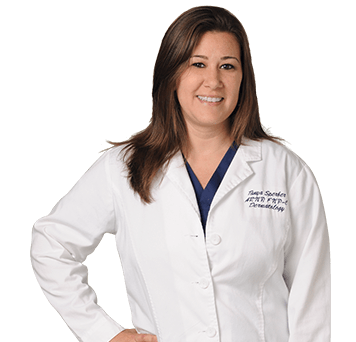 A board-certified nurse practitioner, Tanya began her nursing career in 2000 working in women’s health at Memorial Regional Hospital in Hollywood, Florida, followed by employment at Lawnwood Regional Medical Center in Fort Pierce. Prior to joining Water’s Edge Dermatology in 2013, Tanya treated dermatology patients in Palm Beach and Martin Counties. Tanya’s academic background includes a master of science in nursing and family nurse practitioner certification from Florida Atlantic University, along with a bachelor’s degree in psychology with a minor in sociology. During her graduate studies Tanya was inducted into both the Sigma Theta Tau and Phi Kappa Phi honor societies. Tanya enjoys practicing with the elite group of providers at Water’s Edge in a warm and caring environment where each team member and patient is valued. Tanya provides comprehensive dermatological care, taking time to listen and understand her patients’ particular needs and building a long-lasting and trusting relationship. In her free moments, Tanya enjoys spending time with her husband, Clint, and their two children, Olivia and Drew. They enjoy taking family trips to Tanya’s home state of New York. Fishing, going to the beach, and playing in the park with their puppy, Blaze, are also family favorites.